Looking to boost egg quality and ovarian reserve? Women over the age of 35 attempting conception are frequently tagged with terms such as “advanced maternal age”, “low AMH and ovarian reserves”, “high FSH”, and “poor IVF responder” which are sure to strike fear in anyone’s heart. According to recent statistics by the Australian Institute of Health and Welfare, more women are choosing to postpone baby making until their mid-thirties with 15% of first time mothers aged 35 or older. Statistics also frequently cite that approximately one out of three women over the age of 35 will not have conceived after a year of trying. Until now Western reproductive medicine has insisted that a woman is born with a fixed number of eggs and that the sharp decline in the quality and quantity of eggs after age 35 is irreversible. However, new studies challenge the absoluteness of this view. Our clinical experience and studies now show that in fact, it is possible to improve egg quality and slow down or even reverse the aging process. In the ovarian reserve audio download Gabriela discusses the use of Anti-Mullerian Hormone (AMH) in assessing ovarian reserve. AMH is a hormone secreted by the cells of follicles in the ovaries. When AMH blood levels are measured, these are therefore thought to reflect the reserve and quality of eggs that a woman has left. There is very little research demonstrating strategies to improve ovarian reserve. Conventional wisdom would question whether or not that is even plausible. However data is finally emerging to back our own clinic experience that there is hope for women with diminished ovarian reserves. 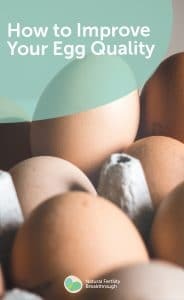 Discover easy to follow guidelines to improve egg quality which when adhered to will dramatically increase your chances of giving birth to a health baby. Recorded live March 2014 in this audio and transcript download Gabriela share’s with discusses the use of Anti-Mullerian Hormone (AMH) in assessing ovarian reserve. AMH is a hormone secreted by the cells of follicles in the ovaries. When AMH blood levels are measured, these are therefore thought to reflect the reserve and quality of eggs that a woman has left. There is very little research demonstrating strategies to improve ovarian reserve. Conventional wisdom would question whether or not that is even plausible. However data is finally emerging that evidences our own clinic experience that there is hope for women with diminished ovarian reserves. We’ve had patients from all over the world conceive with AMHs that their own fertility specialists had said that it was never going to happen yet we have seen and been instrumental in assisting our patients to achieve natural and/or assisted conception, even when their AMH result was less than 1 pmol/l and we are confident that we can help others make good, positive progress.